Home CDN , children , crafts , feature , holiday , holidays , homeschool , January , papercrafts , printables , US , worldwide January 31st - Featuring Green Hornet Freebies! January 31st - Featuring Green Hornet Freebies! -- The Green Hornet is a fictional character - an American pulp hero and masked vigilante - created by George W. Trendle and Fran Striker with input by radio director James Jewell ion January 31, 1936. Since his radio debut in the 1930s, the Green Hornet has appeared in numerous serialized dramas in a wide variety of media. -- It was the series which presented a beloved radio hero in living color on the small screen - and at the same time introduced a martial arts legend-in-the-making, Bruce Lee. 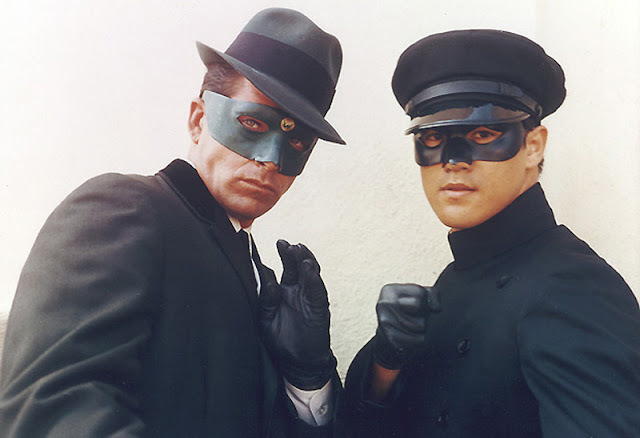 It was The Green Hornet, produced by the team who brought you the 1966 Batman series and starring Van Williams as the emerald-clad avenger secretly posing as a criminal to bring down the most notorious gangsters, racketeers and wrongdoers. Now, in this guide released just as the show turns 50, BRBTV chronicles it all, from the planning of the series in the mid-'60s, as shepherded by character co-creator George W. Trendle and executive producer William Dozier, through each and every episode, to the fandom beyond. • The Green Hornet TV Series Action Figures -- Inspired by the classic Green Hornet television series starring Van Williams as the Green Hornet the vigilante crime-fighter and Bruce Lee as his sidekick Kato. These fantastic 6-inch scale Green Hornet and Kato Action Figures from The Green Hornet figures are highly detailed and TV series accurate and feature multiple points of articulation. The Green Hornet figures include their signature weapons and accessories from the classic TV series. • The Green Hornet Original Serials Collector's Set -- The Green Hornet is a masked fictional crime fighter, originally created by George W. Trendle for an American radio program in the 1930s. The character has appeared in two Universal serials. In the first 13 episode serial, the city is faced with rising crime and increased racketeering activity. Intrepid newspaper editor, Britt Reid (Gordon Jones) becomes the crime fighter the Green Hornet to take on the bad guys. - A day to do everything backward. Try writing backward or reading backward. Wear your shirt with the back in the front. Eat your meal, starting with dessert. Now that's what I call fun! Walk backward, or talk backward. Play a board game backward, from the finish line to the start. Are you starting to get the picture!? - Brandy Alexander is a sweet, brandy-based cocktail which became popular during the early 20th century. It was supposedly created at the wedding between Princess Mary and Lord Lascelles in London in 1922. - Child labor refers to the employment of children at regular and sustained labor. This practice is considered exploitative by many international organizations and is illegal in many countries. - Even though they have created a day for it, I still don't like Brussel Sprouts. However, my son loved them as a little one and still does today. Where do you stand on the brussel sprout issue? - Celebrates art and the effect it can have on your heart. A day to experience art in your life. Food sustains you as a human; art inspires you to be divine. Go to an art museum, browse through an art book at the library, enroll in an art class or commission an artist. Read your favorite poem out loud. Go to a concert or play. Sign up for dance lessons. Today is a day to inspire your heart with the arts! - Born on January 31, 1919, Jack Roosevelt Robinson, athlete and business executive, first black to enter professional major league baseball (Brooklyn Dodgers, 1947–56). Voted National League's Most Valuable Player in 1949 and elected to the Baseball Hall of Fame in 1962. - Ida May Fuller of Ludlow, VT, received the first monthly retirement check—in the amount of $22.54 in 1940. Fuller had worked for three years under the Social Security program (which had been established by legislation in 1935). The accumulated taxes on her salary over those three years were $24.75. She lived to be 100 years old, collecting $22,888 in Social Security benefits.